"This politically informed book demonstrates how war movies are more than just entertainment. They serve-intentionally or not-as a cultural weapon of global empire. Clearly written, richly researched, and persuasively argued, The Hollywood War Machine is a feast for any opponent of militaristic propaganda." "From Tom Cruise in Top Gun down to United 93, about the 9/11 terrorist attacks, Hollywood has played a crucial role in implanting militarism, hypermasculinity, and racism deep in the American psyche. 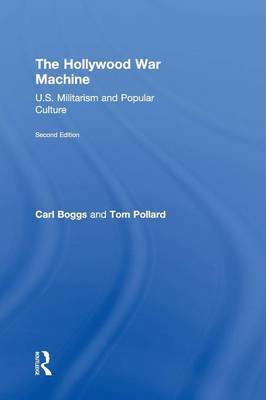 Carl Boggs and Tom Pollard's The Hollywood War Machine is an invaluable contribution to our understanding of American imperialism." "A critical cultural chronicle of postwar American political history. Engaging and penetrating. . . . It patiently relates the complicity of Hollywood in the culture of American militarism." "Opinionated and witty . . . it has fizz." "American intervention and empire since the Progressive Era have not come out of thin air. Instead their politics have been colonizing popular culture at the cinema in Westerns, sci-fi films, spy movies, and political thrillers for decades. Boggs and Pollard develop an excellent critical overview of how and why the military-industrial-entertainment complex has become so powerful during the twentieth and twenty-first centuries in this wide-ranging study of American film. Reading The Hollywood War Machine helps us understand why many think violence is truly as American as apple pie."